Maximum of one checking account per membership. ONLY for Young Adults ages 18-26. Totally free checking, with 3% dividends on the first $500, free ATM transactions, free checks, free Visa Debit Card, free online banking, free mobile banking, free text alerts, free bill pay, free e-statements! For Jumbo rate, $100,000 minimum deposit required. Allows you the ability to bump up your rate to the going 24 month share certificate rate once during the 20 month term. For Jumbo rate, $100,000 minimum deposit required. Allows you the ability to bump up your rate to the going 60 month share certificate rate once during the 56 month term! For Jumbo rate, $100,000 minimum deposit required. Earn the highest APY in our longest term share certificate! For Jumbo rate, $100,000 minimum deposit required. Open to Little Buffalo Accounts, Custodial & Young Adults Ages 0-26. Open with $50 and make deposits anytime with as little as $25. Save, Achieve, Build. This account will help you save for those holiday expenses. Funds are automatically transferred to your savings or checking account on October 1st of each year. Set up payroll deduction to a Vacation Club Account so you can enjoy your vacation stress-free! Open up a secondary savings account to save for a special purpose like a down payment for a house or new car! Example: 15th of the month, enter 15; If you would like to set up the transfer differently; You may log into Online Banking after your account is established. NEW MEMBERS: For identification purposes, please provide a copy of your driver's license, state issued identification card OR passport. If your identification contains an address that is not current or invalid, you will need to also include proof of this change. Acceptable proof documents include: DMV change of address receipt, rental agreement, or insurance policy. EXISTING MEMBERS: If you are currently a member of Interior FCU and we do not have your current ID on file, your ID may be required. 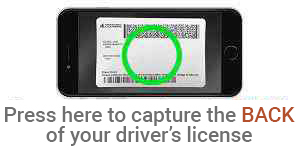 Speed up your application process by providing an image of the BACK of your U.S. driver's license.